New engine rebuild kit for Yamaha Blaster. Crankshaft & Connecting Rod (fully assembled). 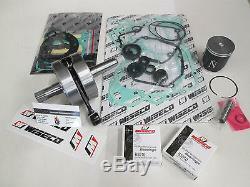 Namura Piston Kit(standard bore). Does not include transmission bearings, oil or Yamabond. This engine does not use a center case gasket. The cases should be resealed w/Yamabond. Factory assembled and trued to within. The item "YAMAHA BLASTER 200 ENGINE REBUILD KIT CRANKSHAFT, PISTON, GASKETS 1988-2006" is in sale since Thursday, May 2, 2013. This item is in the category "eBay Motors\Parts & Accessories\ATV, Side-by-Side & UTV Parts & Accessories\Engines & Components".